November 26, 2012  The court's answer to that question could significantly restrict employer liability in racial and sexual harassment cases, or, in the view of some business organizations, it could result in frivolous litigation. 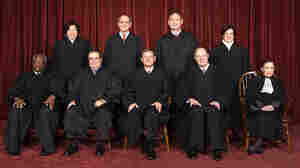 What Happens To Supreme Court In Obama's Second Term? 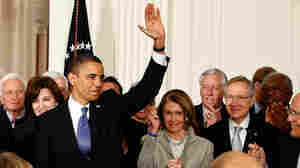 November 11, 2012  As we look ahead to the next four years, it's not just Congress that will undergo change. 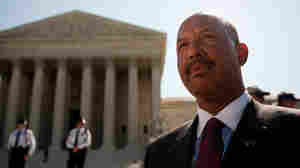 Four of the nine Supreme Court justices are over the age of 70, meaning there's a real possibility for at least one new court appointment during President Obama's second term. June 29, 2012  Back when President Obama was urging Congress to pass his health care law, he rejected claims that the penalty for not obtaining insurance would amount to a tax. 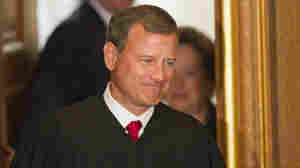 On Thursday, Chief Justice John Roberts begged to differ — while using the tax classification to save the law. And Republicans pounced. June 29, 2012  Thursday's ruling on the controversial health care law showed that perhaps it's best not to pay too much attention to how smoothly oral arguments go, or to the legal prognosticators who try to predict the outcomes. June 27, 2012  Only a few dozen people know how the Supreme Court will rule on the constitutionality of President Obama's health care law. And it'll stay that way until Thursday morning. 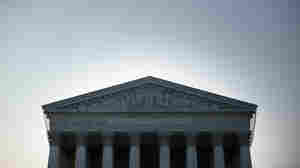 Justices and their law clerks don't leak opinions, which may explain the intense focus on what tea leaves can be read. June 11, 2012  If you're looking to get your mind ready for the news before it's released, we've got some suggested links. 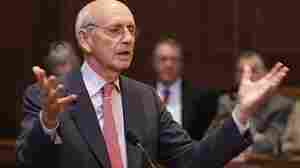 May 18, 2012  US Supreme Court Justice Stephen Breyer's Washington home was burglarized in early May, just months after he and his wife were robbed while on vacation in the West Indies. April 25, 2012  At one spot, songs and chants in English and Spanish called on the court to strike down the law. At another, supporters of State Bill 1070 unfurled flags of the United States, Arizona and the Tea Party. Here are a few of the people who traveled to the steps outside the court on Wednesday. Republicans Have Run Against The Courts For Years; Will It Be Obama's Turn? April 2, 2012  If the Supreme Court decides in June to throw out the healthcare law, will President Obama target the Court during his re-election campaign? March 30, 2012  By the standards of marketing, especially political ads, the RNC's ad is a great success since it has generated so much free media, including blog posts like this. Thursday Political Grab Bag: What's Plan B If Health Law Is Struck Down? March 29, 2012  What should they do if the Supreme Court strikes down the Affordable Care Act in whole or part was a question being asked after the end of oral arguments this week... the GOP-led House was prepared to pass a controversial Republican budget that would make major changes to Medicare... Newt Gingrich met secretly over the weekend with Mitt Romney. March 28, 2012  The job of a White House press secretary is to stay on message no matter how disbelieving the journalists before you. Earnest did what he was paid to do despite the obvious skepticism of journalists to his assertions that the White House had no contingency plans in case the high court strikes down the health law or was pleased with the solicitor general's performance. March 28, 2012  What happens when impassioned demonstrators come this close to each other? 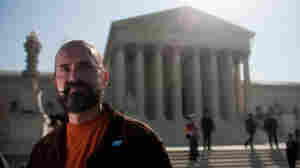 Opponents and defenders of the new national health care law found out this week, sometimes facing off outside the U.S. Supreme Court as the justices inside heard three days of oral arguments on the law's constitutionality. March 28, 2012  The Supreme Court was in the third and final day of oral arguments on the health-care law... Newt Gingrich cut a third of his campaign staff as he focused on a convention strategy... New Florida laws have discouraged voter-registration. March 27, 2012  After Tuesday's high court arguments, former Clinton-era Solicitor General Walter Dellinger told NPR's Robert Siegel it was easy to answer the justices' question about what would stop the federal government from ordering citizens to buy products other than insurance. Colorado Attorney General John Suthers said the more fundamental point was that the U.S government didn't have the power.